You are here: Home / A-Blog / Angel Families Demand Politicians Act After Illegal Alien Kills Mollie Tibbetts. Angel families who have lost loved ones to illegal alien crime were outraged Tuesday after authorities revealed that an illegal alien was announced as the alleged murderer of Iowa college student Mollie Tibbets. All three angel parents were heartbroken over yet another American killed at the hands of a foreign national illegally present in the U.S. They called out strongly for politicians to act swiftly and get behind President Donald Trump on securing the U.S. border. There was also a call to support ICE (U.S. Immigration and Customs Enforcement) and other law enforcement. I pray Mollie Tibbitts will be the very last victim of an illegal alien. Because clearly everyone is wide awake by now and can no longer stand by and do or say nothing or think this will never happen to their loved one. It’s time to get loud and tell our politicians on either side to get behind our president and once and for all secure our borders, support ICE and all other law enforcement and clean up our country for the safety of all. Another preventable death of another American citizen, another tragedy at the hands of an illegal immigrant. How long before it stops? When will it stop? How will we stop it? I’m absolutely heartbroken. My family is absolutely heartbroken and our condolences to the Tibbetts family and friends. It never should have happened. Legal immigrant Durden lost her only son Dominic at the hand of an illegal alien. Mendoza’s police officer son Brandon was killed by a drunk-driving illegal alien. Ronnebeck’s son Grant was shot in the face by an illegal alien robbing the convenience store Grant was working at. 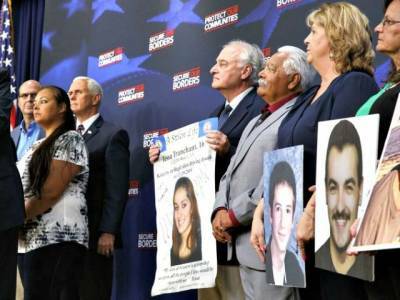 All three angel parents recently spoke at a White House event hosted by President Trump, giving a voice to the victim families of illegal alien crime and recognizing the many law enforcement officials committed to securing America’s borders. Trump previously hosted a roundtable at the White House with many families victimized by illegal alien crime.